The first case of breast cancer was identified in around 1600 BC in Egypt. Since that time, knowledge, understanding, and treatments have increased and improved. However, more than half of patients with breast cancer will develop more aggressive disease even after successful breast cancer treatment. This resistance has been attributed to over-amplification of receptors, gene mutations, and activation of different signaling. A multitude of treatment options are promising in clinical trials; however, the role of breast cancer stem cells (BCSCs) in disease progression and treatment resistance is gaining attention. Therapies designed to eradicate rapidly proliferating cells have little impact on BCSCs, perhaps because of their dormant nature, the authors point out. 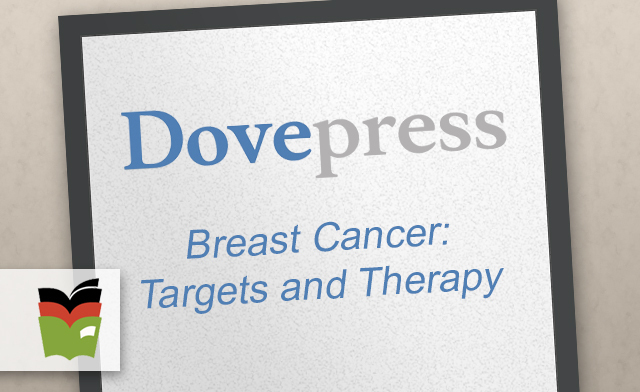 Also lacking are well-characterized surface markers, limiting the effectiveness of targeted therapies. In this review, the authors discuss conventional treatments and novel therapeutics. They also delve into the role of breast cancer stem cells in mediating resistance and currently developing strategies to meet these challenges. Abstract: Since its first documentation, breast cancer (BC) has been a conundrum that ails millions of women every year. This cancer has been well studied by researchers all over the world, which has improved the patient outcome significantly. There are many diagnostic markers to identify the disease, but early detection and then subclassification of this cancer remain dubious. Even after the correct diagnosis, more than half the patients come back with a more aggressive and metastatic tumor. The underpinning mechanism that governs the resistance includes over-amplification of receptors, mutations in key gene targets, and activation of different signaling. A plethora of drugs have been devised that have shown promising results in clinical settings. However, in recent times, the role played by cancer stem cells in disease progression and their interaction in mediating the resistance to cellular insults have come into the limelight. As breast cancer stem cells (BCSCs) are dormant in nature, it is highly likely that they fail to directly respond to the cytotoxic drugs which are meant for ablating rapidly proliferating cells. Furthermore, the absence of well-characterized, drug-able surface markers to date, has limited the application of targeted therapies in complete eradication of the disease. In this review, our intent is to discuss versatile therapeutics in practice followed by discussing the upcoming therapy strategies in the pipeline for BC. Furthermore, we focus on the roles played by BCSCs in mediating the resistance, and therefore, the aspects of new therapeutics against BCSCs under development that may ease the burden in future has also been discussed. The first reported case of any kind of cancer was that of a breast cancer (BC) in around 1600 BC in Egypt, which is not surprising as the organ allowed easier identification. BC, since its first documentation, has been well-studied but is still a leading cause of deaths in women worldwide.1Extensive research has shown that this is due to the heterogeneous nature of the disease itself, which predicts the therapeutic response. Based on the presence or absence of the well-established biomarkers on the surface of BC cells, they are classified into luminal A, luminal B, HER2, and triple negative breast cancer (TNBC).2 Each subclass has diverse risk factors for incidence, disease progression, therapeutic response, and favored organ sites of metastases. Out of these subtypes, TNBC is the most aggressive subtype and shows high metastatic potential. This can be attributed to the high number of cancer stem cell (CSC) population present within the tumor. There is a plethora of therapeutic modalities administered to BC patients on the basis of their initial diagnosis. Landmark discoveries like radical mastectomy, lumpectomy, radiation implants, tamoxifen, trastuzumab, and so on have remarkably helped in improving disease outcome, for a wide number of patients (Figure 1). However, >50% of treated patients come back with a more aggressive disease. This aggressive behavior and resistance to the predicted therapies have marked a major challenge for BC clinics. Reports have shed a light onto the various mechanisms that might be responsible for these resistance mechanisms. Knowledge of the signaling cascades has led to the development of numerous molecules with potential to reduce the burden of the resistance encountered in BC. Even though chemotherapy and radiotherapy have undergone substantial improvements and refinements in efficacy and administration in the past decade, orthodox cancer treatments remain futile for many patients, predominantly whose cancer has been diagnosed at a later stage.3 Delay in cancer diagnosis reduces the overall treatment efficacy mainly due to the increased likelihood of the manifestation of metastatic disease, but also partly because more advanced disease requires more intensive treatment, which may, itself, cause treatment intolerance. In this review, first we discuss the conventional chemotherapeutics in practice followed by the novel therapeutics that are being developed against drug-resistant BC. Further, we focus on the role of BCSCs in mediating the resistance. Lastly, aspects of currently developing treatment strategies against BCSCs are discussed.